It's World War I and an allied warship has just been sunk. The surviving Englishmen with the help of a stubborn All-American protagonist Bowen Tyler (Doug McClure) hijack a German U-boat. That is how The Land That Time Forgot starts out. If it continued in this fashion, we would be left with a relatively boring WW1 movie, as the German and English crews have to learn to cooperate in an environment of mistrust and claustrophobic conditions. The acting here is reasonable but the actors don't have much to work with, with a rather slow, plodding plot. Instead, the U-boat gets lost and ends up in a lost land, complete with active volcano. This is where we turn the ludicrousness level up a notch. This land is inhabited by dinosaurs and cavemen, or more accurately, a whole lot of puppets, really bad models, men with hair glued onto them, painted backdrops and archival footage. Confronted with having to suspend disbelief during all this, the actors resort to overacting, as they scream in terror while dodging pterodactyls, complete with strings or as the model of their ship is rocked by a dinosaur hand puppet. So the special effects are terrible. It's a bit of a shame, as the actual story isn't half bad - the Germans, English and American working together as they discover what is really happening in this world although the script is predictable and slow and isn't particularly well written. It probably does the original novel (written by Edgar Rice Burroughs) a disservice. It is all actually rather entertaining in seeing what the actors have to work with and how they respond, with continuity problems abound as they switch backwards and forwards between studio and outside locations. 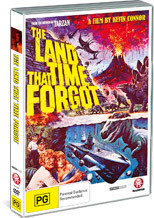 So, unfortunately, the film isn't particularly worth watching and there are definitely better movies that deal with time travel or dinosaurs out there. With this in mind, I am also willing to concede that the nostalgia value of this film coupled with the fact that there is more reasonable action than the average acting makesthis an average B-grade movie rather than an atrocious disaster. The dvd is rather bare, having mono audio with a collection of trailers. In summary, I personally would give this a miss, but there may be people who know what they are in for and may get some enjoyment out of it. You have been warned.